Singin’ in the Rain is one of the most popular movie musicals of all time — and with good reason. It’s set in Hollywood, at the time when sound movies (“the talkies”) are about to burst onto the scene, and two of the biggest stars of the silent screen, Don Lockwood (played by Gene Kelly) and Lena Lamont (played by Jean Hagen) are holding a press conference. Every time that Lena/Jean Hagen tries to speak, Don/Gene Kelly cuts her off — and with good reason. The audience soon hears Lena/Jean Hagen speak in a high-pitched, squeaky Brooklyn accent, and we also learn that she is not the smartest person in Hollywood — even though Don/Gene Kelly despises her, she believes that they are engaged, since the movie fan magazines say so. 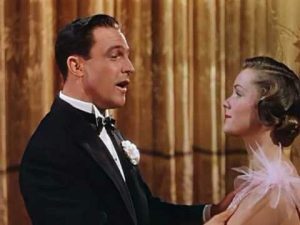 We also learn of Don/Gene Kelly’s background in a very funny sequence, where he explains that during his rise in Hollywood his motto was “Dignity, always dignity.” The audience is treated to video of his real background, where Don Lockwood (along with his best friend, Cosmo, played wonderfully by Donald O’Connor) were song-and-dance men who played in vaudeville, bars and other “low” places, ending with his getting promoted from stuntman to actor, where he first meets (and later spurns) a very snooty Lena Lamont/Jean Hagen. 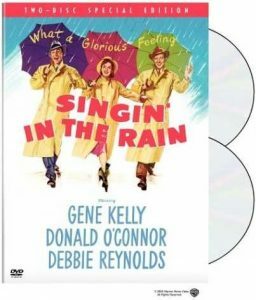 Later, Don Lockwood/Gene Kelly meets a “real” actress, Kathy Selden/Debbie Reynolds, who pooh-poohs his “movie acting” — and triggers a crisis of confidence, where Don/Gene Kelly faces the truth that he’s known inside for years — he’s not an actor at heart, but a song and dance man. Add to this the love triangle between Don/Gene Kelly, Lena/Jean Hagen and Kathy/Debbie Reynolds, and then superimpose over that the stress of the movie studio needing to revamp production to incorporate sound into the movie, and you have plenty of conflict. Even more angst is in the wings as they attend a preview of the current Lockwood and Lamont movie, with sound, and the same audience that used to gush over them is now laughing at them, making Don/Gene Kelly think that his career is over. Don, Cosmo, and Kathy talk until sunrise, leading into the Good Morning musical number Then, some of the conflict is resolved by Cosmo’s suggestion that they have Kathy dub the voice and singing for Lena. There’s an extended musical number, supposedly as a dream sequence from the movie (The Singing Cavalier) that the studio is filming — but is actually an excuse for Gene Kelly to demonstrate his dancing skills. But more than that, it allows the audience to see the resolution of Don Lamont’s inner conflict, as he rehearses his true history as a song and dance man who comes to the big city, with Gotta Dance!, but who gives in to the temptations of success, and forsake his driving talent of dancing. A “romance” with Cyd Charisse is shown visually, along with heartbreak; afterward, another young dancer walks by, dressed as Don Lamont/Gene Kelly was at the beginning of the number, with Gotta Dance! — reminding Don of his true passion, and allowing him to embrace it again. Lena is not about to be swept under the rug, however, and she demonstrates her ruthless and controlling nature, leading into a final conflict, that is humorously resolved by Don/Gene Kelly, Cosmo/Donald O’Connor and the head of the studio revealing “the real star of the picture”. It’s a wonderful picture, with many great song and dance numbers, interesting characters, wonderfully funny humor (especially with the wonderfully funny Donald O’Connor), and is highly recommended. Gene Kelly, Donald O’Connor and Debbie Reynolds in 45th-anniversary restoration of the best-loved Hollywood musical ever-filled with memorable songs, lavish routines and Kelly’s fabulous song-and-dance number performed in the rain. Check out the funny movie quotes from Singing’ in the Rain — a lot of verbal humor, with a lot of punchlines.